The best racing simulation out there, it's better than even GT4. Realistic physics, true-to-life tracks, a huge assortment of cars from around the world, and a challenging tuning aspect make Forza one of the coolest racing games out there (and definately the best for the Xbox). Haha, takes a lot of fiddling with settings. :\ Hours and hours of tuning. Much fun, especially when you finally pull one off in the end. FD drift!! Sorry bout the crap video quality, I only managed to get a direct port of the audio. Soon to have a higher-quality vid, and ones of my STi doridori. Oh, that's good then.... I found GT3 for $3, and GT4's still $40something. And speaking of prices, Forza's only $35 or something now... the price went down like a week after I got mine for $55. Bummer. hehehehe!! i still dont have it (damn) i wish to see your sti dori dori man. i steal your car! then i buy forza and beat you down!!! And damn, the FD is hard to control. I maximized grip everywhere, and it still goes flying. Mebbe I need more finesse. Or maybe I need a wheel. hoooo bruddah!! nice!! yea the wing is a wee bit big, can you imagine a forza arcade system?!?!! I'm stuck on the endurance races, 8+ laps do me in just by sheer length. Not to mention the extreme stress your self-esteem takes when you do fine until the last lap, and get passed with two corners left. Isn't this the game that you based Nadeshico off of? nope Nadeshico is based on Initial D which has a story...Forza is a simulation game. I used Forza Motorsport to recreate the cars in Initial D, because Forza has (most of) them. Forza is a simulation racing game, somewhat like the Gran Turismo series, and unlike the Need For Speed series. I can post screenshots of the actual gameplay, if you like. ...Okay, not really. I'm just not used to the physics of it. It's actually very well done. Oh, I see. That's cool though. And what's with that irritating space in your post, viper2681? To catch people off guard, duh. Be nice... my screen resolution is small. Check the Nadeshico thread for Forza screencaps. ...Well, caps of the car choosing process, that is. I meant actual gameplay screenshots, Viper2681... 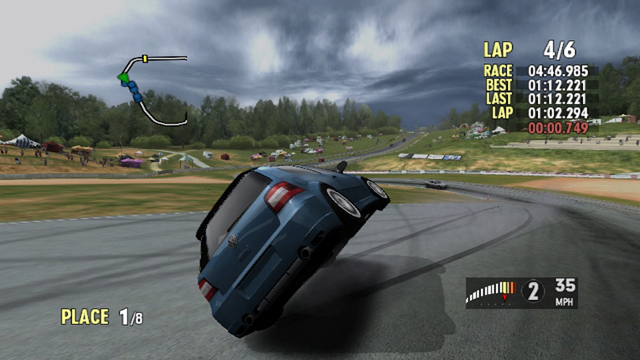 I've heard that this game's graphics are good, I wanna see firsthand to compare them to Gran Turismo 4. That Golf GTI got owned. Even though he's in first place and just showing off his mad skills? Is there a Z challenge? i dunno, I don't really like the new Z very much. Is there a Ferrari challenge? ^ Sure is, the Ferrari Supercar Challenge in the Professional series. The only cars allowed in are the F40, F50 and Enzo. Speaking of Enzo, it's top speed is 1337.... I can manage a 255mph without drafting. proof below. Woahhh....looks like you hit the wall on the first corner!!! thats' crazy! can you make a drift MR2 for me? please? What's the points unless you have the game [unless of course you do]? It's going to be pointless to see someone drive YOUR favorite car and making it look good...wellll not really but you know what I'm trying to get at.